It’s no secret that I’ve been a contributing author at RainToday for many years. In that time, I’ve had the opportunity to collaborate and connect with many thought-provoking professionals. Recently, Mike and I sat down again and discussed his new book, Insight Selling: What Sales Winners Do Differently, that delves into this same topic in further depth. After reading the book cover to cover in a matter of hours, I was thrilled to get further insight and chat about his findings. CG: The sales world has changed dramatically over the past several years. There’s a lot of conflicting advice out there on what works and what doesn’t. In doing research for Insight Selling, what strategies or tactics did you uncover that work today? MS: Since articles like “The End of Solution Sales” and “Selling is Not About Relationships” were published in by the Harvard Business Review, there’s been a lot of disagreement in the sales world about what’s working and what’s not. We decided to study what was actually happening. 1. Connect with buyers personally and connect buyer needs with their solutions. 2. Convince buyers they are the best choice, that the risks are worth taking, and that they can achieve strong ROI. 3. Collaborate with buyers by bringing new ideas to the table, delivering new insights, and working with buyers as a team. And we found that solution sales is not dead and that relationships are still important. Sorry, HBR. Solution sales and relationships need to evolve and they are just a piece of the whole, but they’re far from dead and sellers who dismiss these concepts outright put their sales results in grave danger. CG: What surprised you most about your research findings? MS: We studied 42 factors that were common pieces of advice given to sellers in order to determine what sales winners do differently. In our training programs, we poll our audiences asking them to guess what they think sales winners do most differently than second-place finishers. They usually pick things like, ‘was trustworthy,’ or ‘listened to me,’ or ‘understood my needs,’ and so on. They rarely pick ‘educated me with new ideas or perspectives,’ which, according to buyers, was the number one factor separating winners from the rest. And they rarely pick ‘collaborated with me,’ which was the number two factor most separating winners from second-place finishers. With this last point, there’s been a lot of buzz that the new trend in selling is to challenge buyers. Our training participants often say to us, “Isn’t the word ‘collaborate’ more of an antonym than a synonym of the word ‘challenging’?” Perhaps. So it’s not only surprising to our training participants but also to us, because these two factors are not what we would have guessed to be what most separates the winners from the rest. Now, this doesn’t mean sellers who win don’t say what they need to say in order to help the buyer. But they don’t do it standoffishly. So, what sellers think buyers want and what buyers actually want are two surprisingly different things. 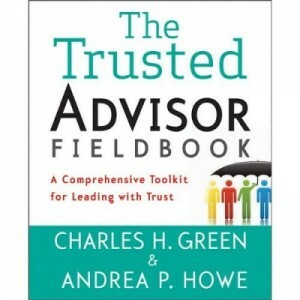 CG: In the book, you introduce a three level model that I love – Connect, Convince, Collaborate. How does this change the way people need to sell? MS: With connect, even though prevailing thinking in sales has been focused on uncovering needs and crafting compelling solutions to solve those needs, sellers still fall into the pattern of not listening, not investigating, and not tailoring what they sell to the needs of the buyer. With convince, it’s been drilled into the minds of so many sellers not to pitch or sell anything too strongly that they are unwilling to take a point-of-view or advocate for a particular idea or strategy. With collaborate, too many sellers have been trained to think of sales as me-versus-them. Or to just try to find ways of selling what they offer. Or simply don’t engage deeply enough. What’s important is that these are the things that buyers value, so they’re the things sellers need to do. CG: You break down insight selling into two applications – interaction insight and opportunity insight. Can you explain the differences between the two? MS: When sellers introduce buyers to ideas they need to know about we call it opportunity insight. This is when the seller knows a buyer should be doing something and the buyer has little or no idea about it until the seller brings it up. Now, I’m not saying go straight to the pitch—there’s a rhythm to getting there—but fundamentally, sellers need to get the passionate beliefs they have in their heads about certain ideas into the buyers’ heads. The second application is interaction insight. This is when sellers ask disruptive questions, push buyers out of their comfort zones and encourage them to think differently. In this case, buyers often come to new insights by working collaboratively with the seller guiding them. Sellers bring ideas (opportunity insight), and spark ideas through how they lead their conversations (interaction insight). CG: But the buyer has to trust you if they’re going to accept your insight. Don’t you agree? They can get information anywhere, but when they trust the person it’s coming from it makes a big difference. The more a buyer trusts you the more willing they are to listen to your ideas and to implement them. Without trust, insight selling is very difficult to do. CG: Increasingly we hear how buyers don’t trust information from corporations and sellers – that they trust information from third parties, their peers, or even strangers. How can a salesperson get around this? MS: Well, Charlie, I’d say they should all listen to you. There’s not much an individual seller can do to restore someone’s faith in corporations, but they can certainly build faith in them as people and can influence strongly whether a buyer perceives their company to be trustworthy. When a buyer meets a seller, on the one hand they bring with them a modicum of skepticism about the seller’s competence and motives. On the other hand, when a buyer meets a seller for the first time, that seller has a blank trust slate. It’s up to the seller to bring their “A” game and demonstrate competence and behave overall in ways that the buyer forms the impression that the seller is trustworthy. Every seller is essentially playing on the same playing field of trust. It’s what they do on that playing field that matters. CG: What’s the biggest misconception sellers have about trust and where do sellers often fall short when it comes to establishing and maintaining trust with buyers? What does it mean for trust? Sellers overestimate their competence and buyers don’t. Proving they are competent and have integrity – that they are worthy of trust – is a steeper hill than many sellers think. Insight selling plays in here. You need to get people to trust your ideas, your advice, and your ability to get things done for and with them. Until they have experience with you, the well of trust you build won’t be very deep. This is why collaboration is so powerful, because it creates shared experience where buyers can be exposed deeply to your competence while spending time with you. At the same time, spending time builds intimacy. All of it leads to trust. If you want to learn how to sell like winners do, pick up your copy of Insight Selling today. If you order by May 10, RAIN Group has some great bonuses for you. You’ll receive the exclusive expert interview series What it Takes to Succeed in Sales Today with myself, John Jantsch, Jill Konrath, Andrew Sobel, and more along with 5 lessons from Insight Selling and RAIN Selling Online training programs. You’ll also be invited to join Insight Selling author, John Doerr for an exclusive webinar, What It Takes to Become an Insight Seller. Plus, RAIN Group is donating their portion of book sales during the launch to the American Heart Association to support congenital heart defect research (learn why here). So go order your copy today. Mike and John are the real deal.